I’ve posted several times about the dangers of creating too much government dependency, including a set of cartoons that illustrates how small welfare states inevitably erode social capital and create big welfare states. 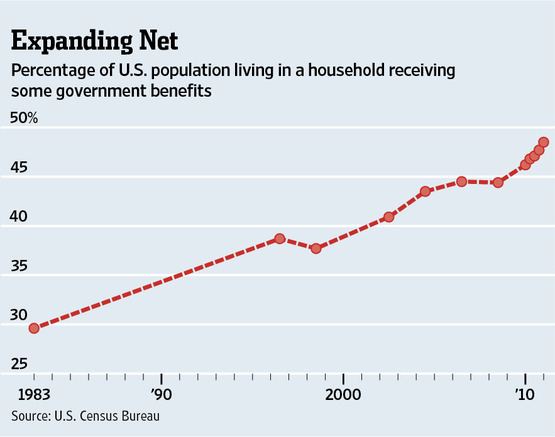 So you will understand that I am utterly depressed by this new chart from the Wall Street Journal showing that nearly half of all American households receive some sort of government handout. What makes this chart especially frightening is that the numbers will get even worse as the baby boom generation retires. Barring some dramatic change, America is doomed to become another Greece.